My bags are (almost) packed, plans are made and my car is full of gas - on Friday, I'm hitting the road for Wisconsin. It's time for a long weekend at the cottage! It's been a tradition in my family for 23 years - every summer, we pack our bags and head to the cottage during the week of the 4th of July. Family flies in from all across the U.S. to celebrate the summer and each-other, drinks and delicious food included. Sleeping in, morning chats over coffee, quickly packing a beach bag and heading to the lake as soon as possible. Followed by hours on the boat, family dinners and smores by the campfire. Drinks included, all day long. Hey, it is Wisconsin. The best part of all is spending time with my family, some of whom I only get to see once or twice a year. And at the cottage, the lake time is family time. Cramming our enormous family on the boat and dock, our family just couldn't be any closer...literally and figuratively. And it's right around the corner! 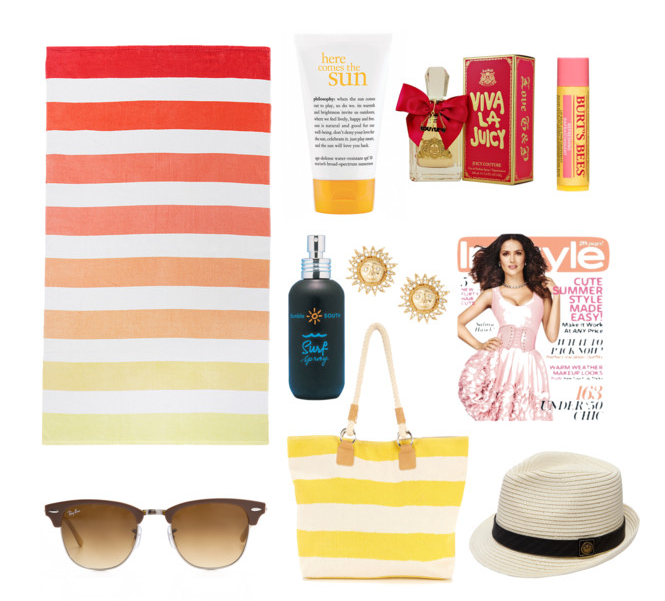 So in celebration of my mini vaca, here are my beach essentials - I'm a pro by packing for the lake at this point!